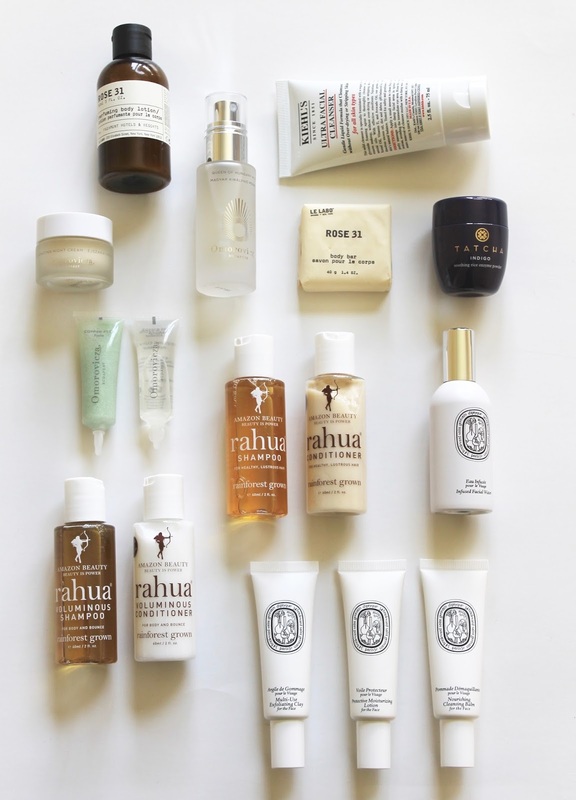 Rahua Jet Setter Kit - Forgo the harsh, chemical-laden hotel shampoo and keep strands shiny when you get to your destination. 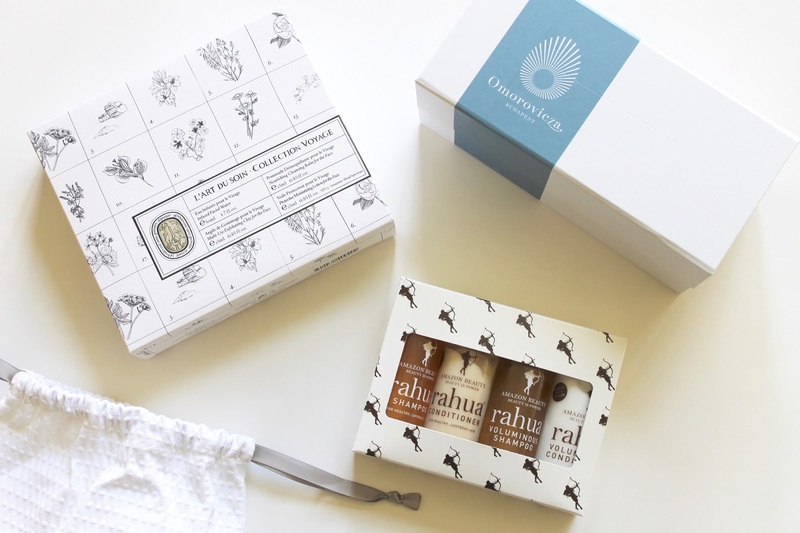 I've been using the Rahua Shampoo and Conditioner regularly, so this kit was an obvious must-pack for me. 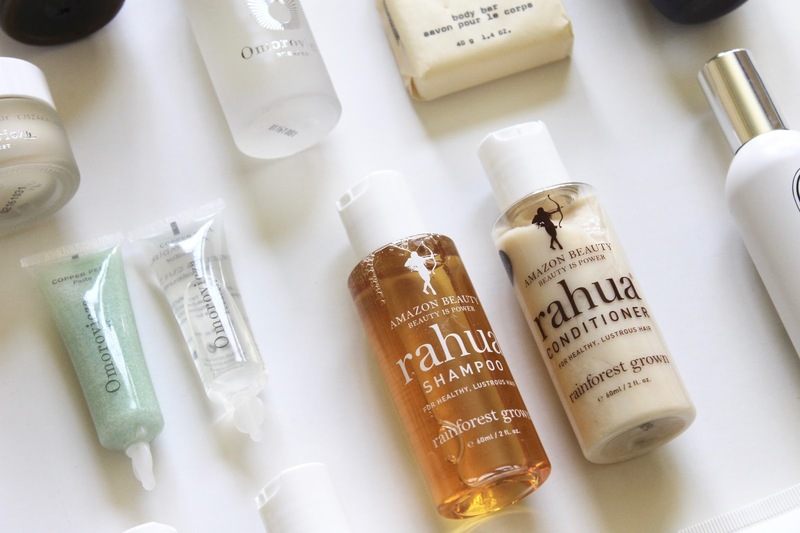 It contains one 2 ounce pair of Rahua's classic Shampoo and Conditioner, and one pair of the Voluminous Shampoo and Conditioner, which pretty will see you through your trip with ease. 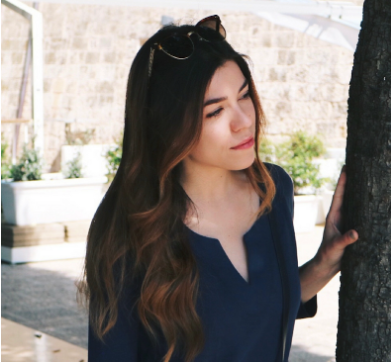 I am excited to test the Voluminous version while away, seeing as my hair always tends to fall flat while traveling, but better yet the uplifting scent of palo santo and Rahua oil will help lift jetlagged spirits. 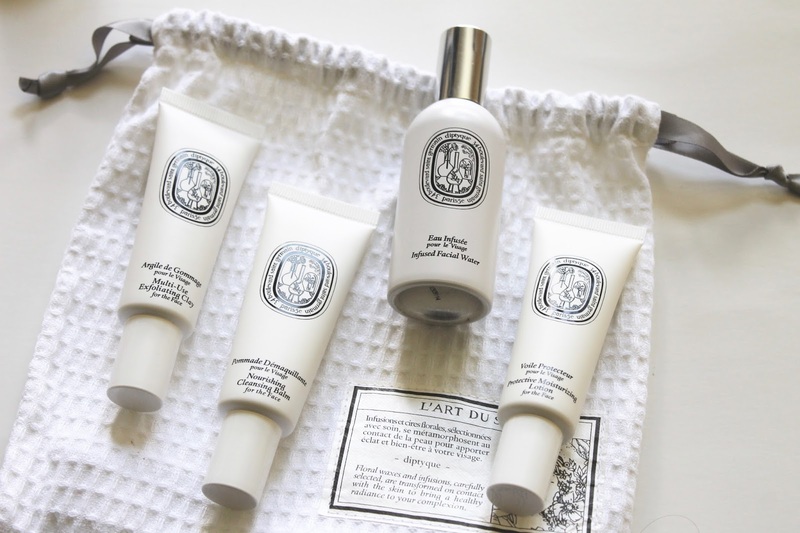 Le Labo Travel Set Rose 31 - This is the ultra-luxe all in one set that I reach for when I want to smell amazing - the scent lingers all day. Like I said, I do love bringing along luxe products when I'm away because it almost turns the entire trip into a spa experience. These come in really great sizes, each bottle is 3 ounces and the soap is 1.7, so you won't be running out of anything. I will say though, that while the smell is amazing I do prefer the body products in the kit, because I'm more a fan of the Rahua for my haircare, as it's a bit more nourishing. If you happen to be staying in a Fairmont you may be lucky enough to come across one of these as the dopp kit included in your hotel bathroom. A heart eye emoji-worthy bonus. Malin & Goetz Essential Kit - The easiest to pack, streamlined kit of must-haves from Malin & Goetz. The wannabe minimalist in me loves this, and while it's perfect for weekends away (literally, perfect) if I'll be gone longer I'll need to swap out the cleanser for a larger one and bring a few extra products for backup. I'm a big fan of their formulas (I'd say they work for many skin types) and they're very easy to fit in that quart-sized bag, so it's not an issue having to squeeze a few extra pieces in when needed. Tatcha - With an entire site page devoted to mini-sized products, it's easy to tailor your routine on-the -go. I love the Polished Classic Rice Enzyme Powder because it doesn't count as a liquid when traveling and gently exfoliates congested travel-skin. Another favorite is the Luminous Dewy Skin Mist because it makes moisturizing easy, and helps defeat dehydrated skin while flying. The teeny bottle is also adorable and easy to slip in your handbag when boarding. Kiehl's - Go there for the face cleansers, which is always one of those products I struggle to find in the right size for travel. I always need more than 1 ounce (which is the size many tend to come in), but I also don't want to lug my full-sized tubes with me. Kiehl's does a few of their best sellers in 2.5 ounce bottles, which is enough to see me through even lengthier trips. 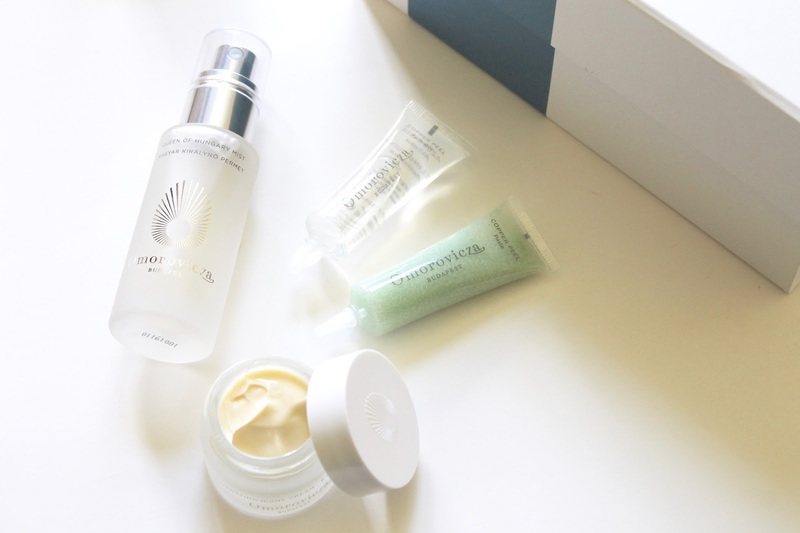 I recommend the Ultra Facial Cleanser or the Calendula Deep Cleansing Foaming Face Wash, both of which foam up and remove makeup completely, without leaving my skin dry. Can't find what you're looking for here? Check Sephora's travel section or for harder to find sets check the Spa-llywood website. Happy (beautiful) travels, and keep your eyes peeled for a pack-with-me video this week as well. Heading somewhere exciting so don't forget to subscribe to my YouTube channel and follow me on Instagram @necessarynothings.